NATIONAL HARBOR, MARYLAND, A.K.A. A MAMMOTH HOTEL AND CONFERENCE CENTER ON THE POTOMAC RIVER — Chris Christie's segment of the program Thursday at CPAC, the great conservative cattle call, was launched to the tune of "Sweet Child O' Mine." Better, perhaps, would have been a song by Christie's second-favorite New Jersey rock star, “When We Were Beautiful” by Mr. Bon Jovi, because this long-anticipated appearance was all about wistfulness and what-might’ve-beens. This was never going to be an easy crowd for Christie—he did, after all, stay away last year, back when he was in his bipartisan-moderate-running-for-reelection mode, and the memories of his embrace of President Obama just before the 2012 election were still fresh in conservatives’ minds. But his eventual appearance here in advance of a 2016 presidential campaign was if nothing else going to be charged—the hugely popular Republican governor of a blue state, a guy who can really give a barnburner, come to tell the bastion of movement conservatives that if they want a Republican to hold the high office again in the first quarter of the 21st century, he was their guy. Alas, ‘twas not to be. As soon as Christie stepped on stage, it was apparent that the scandal over the politically-motivated lane closures at the George Washington Bridge in September, and everything else we’ve learned about the Christie Way since then, has completely taken the charge out of not just Christie but this great coming-together. 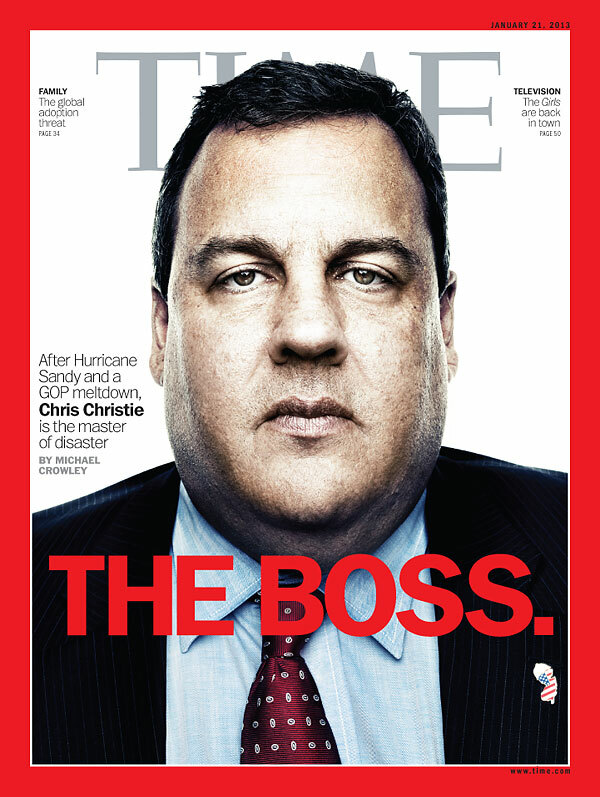 The giant of 2016 speculation who loomed over that Time cover as the “Boss” not that long ago at all now comes across as strikingly smaller, both literally (congrats on that) and figuratively. There was some speculation after the scandal broke that conservatives would rally to Christie’s side, despite all their misgivings about his relative moderation on some issues, simply out of sympathy for any man under attack by the liberal media. But his appearance here suggested that is not going to be the case, or not nearly enough to carry him through a 2016 primary (a new poll from the Washington Post and ABC backs this.) The fact is, there were all along two reasons conservatives, or enough of them, would be willing to live with Christie as a nominee. One is the purely expedient one, the dream of challenging Hillary Clinton not only in purple states but in blue ones. The other, which is often overlooked, is that Christie was poised to rally plenty of conservatives with his knack for bashing many conservative bête noires with untrammeled, gleeful scorn. No, he maybe didn’t agree with you on immigration reform or the propriety of appointing Muslim judges, but he could denigrate lazy, overpaid teachers better than Ted Cruz or Rand Paul could ever dream of doing. Both of those rationales are now out the window. (As is the underlying premise of the electability argument, which he would offer directly to more moderate Republicans and to general election voters—that he knows how to create bipartisan bonhomie with elected Democrats. That claim looks suspect in light of the experience of New Jersey officials like the mayor of Fort Lee. )* The electability argument falls apart with every (admittedly premature) poll showing his Hillary matchup numbers in decline, not to mention the hit his standing has taken with party fundraisers and conventional wisdom–setting commentators. It is the deflation of the other asset, though, that was on display here Thursday. Christie can no longer hold a crowd—even a skeptical one—in thrall with the sheer force of his big personality because we now know all too much about what else the force of that big personality can do and inspire. His rhetorical browbeating of political enemies unavoidably brings to mind his less rhetorical attacks on foes. Not to mention that it’s hard to exude the snappy panache of a conquering hero—the Christie of 2012 and 2013—when you know your administration is under investigation by the very U.S. Attorney’s office that launched your own career. So it was a severely chastened Christie who took the podium. He opened by touting the public employee benefit reform he signed in his first term. He told the well-worn story about going in front of a firefighters’ convention amid boos and catcalls and leaving with “two thirds of the audience cheering.” He issued the moderate reformer’s call to action: “We’ve got to start talking about what we’re for, not what we’re against. Our ideas are better than their ideas, and that’s what we have to stand up for.” But similar lines had already been delivered by Paul Ryan, and would be later by other 2016 possibilities. What was going to set Christie apart was his pure verve, and it’s the verve that was so lacking today. Even his concessions to the crowd were veiled and halfhearted, like his defense of the Koch Brothers, whom he hailed opaquely without actually naming them: “two American entrepreneurs ... great Americans creating great things in our country.” He dutifully ticked through praise of other Republican governors—his mention of Wisconsin’s Scott Walker got more applause than just about anything else he said, and his mention of Michigan’s Rick Snyder included praise for Snyder’s passage of anti-union right-to-work legislation in Michigan. That last one was eyebrow-raising given that Christie has opposed similar legislation in New Jersey and has cultivated crucial bonds with private-sector unions. One couldn’t help but wonder whether he would’ve felt it necessary to praise right-to-work laws as a way to ingratiate himself with the crowd if he had been freer to ingratiate himself with his belligerent charm. On it went. A swipe at the media, but no attempt to really score points with that, which would have required casting himself as a victim of their persecution and thus alluding to the bridge scandal. A swipe at Obama for failing to lead, and instead engaging in “sideline spit-balling.” And then the big crowd-pleaser, declaring that in his America, “Teachers who teach, stay. Teachers who don’t, go.” But even that red meat came off as a bit flat when delivered without the alacrity of the pre-Bridgegate Christie. Strip political speech mocking your enemies of the requisite high spirits and it can come off as merely sneering. That was going to be a hard case to make regardless, even for the demi-god who strode the Jersey shoreline comforting the afflicted and vowing resurrection. But it now seems an all but impossible case for the mere mortal who came to Washington today. With the voracious, crowd-pleasing, mythical beast caged, what does Christie offer? The likely Republican field already has an eviscerator of public-employee benefits, and he’s vastly more acceptable on the other issues. It already has someone willing to make a forceful case against Rand Paul anti-interventionists, and, unlike Christie, he is free to give full vent to his considerable rhetorical powers. What, exactly, does Chris Christie now offer? *This piece was updated on Thursday night to add the parenthetical by way of elaboration, and to correct some mistranscriptions of Christie's remarks.